The Airtrain system in place at Newark and JFK is fast and convenient. Here are some of the most convenient and cheap ways to reach JFK, LaGuardia or Newark Airports in time for your flight. New York City has the highest density of air travelers of almost any place in America. Yet, getting to and from any of the three major metro airports can be a slow, tedious and expensive proposition. If you need to reach a New York metro airport without the aid of a friend or family member’s lift, here is FTF’s guide to some of the most convenient and low-cost ways to reach JFK International, LaGuardia or Newark Liberty. What are those blue and yellow minivans you’re seeing on the streets of New York? Welcome SuperShuttle, which long ago swept other major airports, and now provides group rides to and from Manhattan to Kennedy, LaGuardia and Newark airports, in addition to private cars, customs, and shuttle service in dozens of US cities. New York area rates range from $15 to $25 and discounts are offered to additional passengers in the same party; major credit cards are accepted on board. Wheelchair vans are available upon request. Pick-ups can be arranged, on demand, 24 hours a day, from your home, office or hotel. Visit Supershuttle.com for info, exact rates and to make online reservations. 24-hour notice is suggested. The only downside is that the trip, because you’re picking up other passengers, will be slower than by other means. The same rates apply to most private car services (dispatched cars or limos which can be ordered in advance), though there is no fixed return from JFK. The advantage of using a car service is that they charge a flat fee regardless of the travel time it takes on often congested highways. However, all these rates may vary up if there’s a rush hour surcharge, a suitcase fee, or you have to pay the exorbitant Port Authority of NY and NJ tolls. If you do the math, you can see that with a family of four, it may be cheaper to take a taxi than other transport. To LaGuardia Airport: The M60 public bus runs from Manhattan’s Upper West Side (1st stop is 106th and Broadway), across 125th Street through the heart of Harlem, and out to all LGA terminals in Queens from approximately 5am to 1am, seven days a week. Allow 60-75 minutes if you’re boarding from West 106 Street. The bus connects with the 2,3,4,6,1,A,C,D subway lines in Manhattan and the N and W lines on Astoria Boulevard. The M60 runs every 15-20 minutes (a bit slower on holidays and weekends) and costs $2.75 each way. This line is due for an upgrade to Select Bus Service soon, which means it will run a faster, express-style route and have fare machines at bus stops in order to expedite the boarding process. Click on MTA.info or use one of their many sophisticated apps for information about getting to the airports from other routes via public transportation. Click on the linked Airport name for a wide array of choices between scheduled express buses, limousines and other private options from all boroughs and nearby suburbs to and from JFK, LGA, and EWR. For information on other local bus service from Brooklyn and Queens to JFK and LGA, visit MTA Information. For more than a decade, the Port Authority of New York and New Jersey has provided a rail link fast connection between Newark Airport and Manhattan, as well as other destinations. The airport’s monorail system delivers you to the Newark International Airport Station where New Jersey Transit trains depart for a 20-minute trip to Manhattan’s Pennsylvania Station or to several points in New Jersey. Or, you can catch Amtrak trains directly to Philadelphia or Harrisburg, PA; Wilmington, DE; Washington, DC; Stamford or New Haven, CT or Boston, MA. If you are heading to Hoboken, Jersey City or points in lower Manhattan, you can also depart the AirTrain at Penn Station in Newark, NJ and transfer to the PATH train, which only costs $2.75 each way. 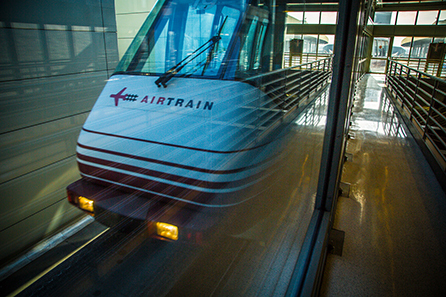 More detailed information on AirTrain. AirTrain is available 24/7 for easy transportation to and from JFK, eliminating concerns about traffic jams and parking. From Manhattan take the A train marked “Far Rockaway” to the Howard Beach station where you will board the AirTrain. Alternatively, you could take the E, J or Z trains to the Sutphin Boulevard station in Jamaica and connect to the AirTrain there. It is about a 15-minute ride to the airport from either stop (allow about 90 minutes from midtown in total, including the subway ride) and the fare is $5 for AirTrain (children <5 ride free), plus $2.75 for the subway. Additionally, for about three times as much, you can transfer to the LIRR at Jamaica Station for a more comfortable, 35-minute trip to Pennsylvania Station in Manhattan. For more information, visit AirTrain. At both JFK and Newark, AirTrain travels on a route around the airports, making frequent stops at terminals, parking lots, hotel shuttle areas and rental car locations, free of charge.